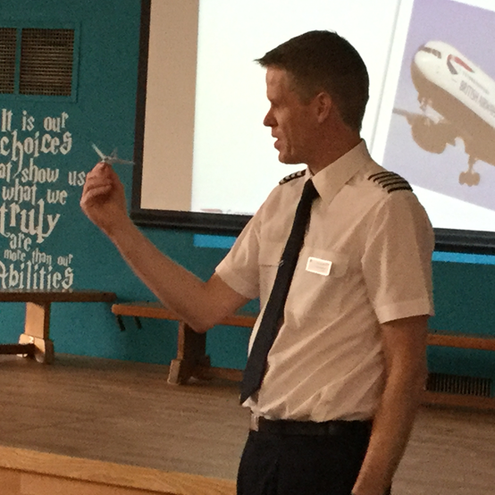 On Wednesday 27th March, Mr Heaven came to visit the year one classes to tell them all about his job as a pilot. Mr Heaven told the children about a day in the life of a pilot. He talked about how he became a pilot and his training, he told the children about the preparations he makes before a flight and he explained to the children how airplanes can fly. Then the children watched a video of a plane taking off from 3 different angles! Then, of course, the children had LOTS of interesting questions about airplanes and flight which Mr Heaven kindly answered. He then gave each child a special pilot’s sticker and paper airplane. We would like to say a huge thank you to Mr Heaven for spending his afternoon off with year one.